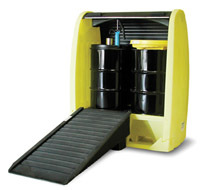 Free up indoor storage and take hazardous materials outside with the HAZARD HUT®. One-piece 100% polyethylene construction with UV protection makes it durable with no joints or seams to leak. 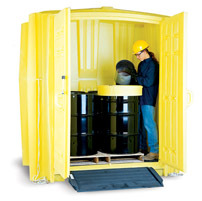 Big double doors provide security and easy access for up to four 55 gallon drums. 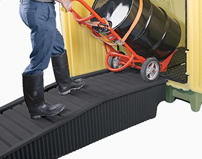 4-way forkliftable design make the HAZARD HUT® easy to handle (forkliftable only when empty). 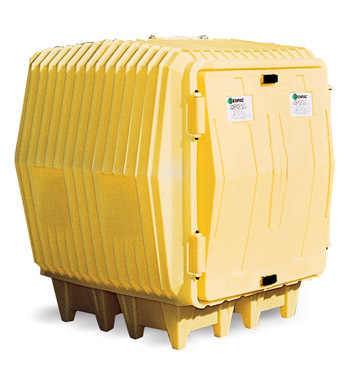 Massive sump has removable structural foam grates for easy cleaning. This item is oversized and must ship with a LTL freight company. This item ships directly from the manufacturer. Shipping rates are estimates only and do not include fuel chages that may change daily. Actual rates may vary.